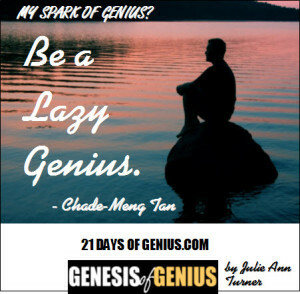 5 Be a Lazy Genius. I am often most creative when I am lazy. except allowing the mind to abide in that state. The relaxed mind is calm and highly conducive to the arising of ideas. When the mind has that quality, ideas often emerge that would otherwise not have come out of their comfortable hiding places when the mind is full of noisy chatter. The joyful mind is highly conducive to finding connections between random ideas. That quality of mind is like a playful child, always putting ideas together and finding something fun about their unexpected connections. The clear and alert mind is like a patient photographer, sitting silently waiting for something beautiful to happen, and then skillfully framing the scene that emerges. With those qualities combined, the alert, relaxed and joyful mind is a highly creative mind. just be lazy like me. and then allow any thought to arise or not arise on its own will. 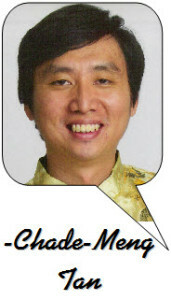 Chade-Meng Tan is the official Jolly Good Fellow of Google. A Google pioneer, an award-winning engineer, a New York Times bestselling author, a thought leader, and a philanthropist.